(Known in Latin as pluviale or cappa), a vestment which may most conveniently be described as a long liturgical mantle, open in front and fastened at the breast with a band or clasp. As existing monuments show, whether we look at pictorial representations or at the copes of early date which still survive, there has been remarkably little change in the character of the vestment from the earliest ages. Then as now it was made of a piece of silk or cloth of semicircular shape, and, as it is important to note, it differed from the earlier form of chasuble only in this, that in the chasuble the straight edges were sewn together in front while in the cope they were left open. The most conspicuous external modification which the cope has undergone, during the past thousand years and more, lies in a certain divergence in the shape of the hood, a feature which, after all, is not in any way an essential part of the vestment. In some early examples we find only a triangular hood, which was no doubt intended to of practical utility in covering the head in processions, etc. But with the lapse of time the hood has into a mere ornamental appendage, and it is quite commonly represented by a sort of shield of embroidery, artificially stiffened and sometimes adorned with a fringe, the whole being fastened by buttons or by some other device to the back of the below the broad orphrey which usually forms an upper border to the whole. The fact that in many early chasubles, as depicted in the drawings of the eighth and ninth centuries, we see clear traces of a primitive hood, thus bearing out the explicit statement upon the point of Isidore of Seville, strongly confirms the view that in their origin cope and chasuble were identical, the chasuble being only a cope with its edges sewn together. The earliest mention of a cappa seems to meet us in Gregory of Tours, and in the "Miracula" of St. Furseus where it seems to mean a cloak with a hood. So from a letter written in 787 by Theodemar, Abbot of Monte Cassino, in answer to a question of Charlemagne about the dress of the monk (see Mon. Germ. Hist. : Epist. Carol., II, 512) we learn that what in Gaul was styled cuculla (cowl) was known to the Cassinese monks as cappa. Moreover the word occurs more than once in Alcuin's correspondence, apparently as denoting a garment for everyday wear. When Alcuin twice observes about a casula which was sent him, that he meant to wear it always at Mass, we may probably infer that such garments at this date were not distinctively liturgical owing to anything in their material or construction, but that they were set aside for the use of the altar at the choice of the owner, who might equally well have used them as part of his ordinary attire. In the case of the chasuble the process of liturgical specialization, if we may so call it, was completed at a comparatively early date, and before the end of the ninth century the maker of a casula probably knew quite well in most cases whether he intended his handiwork for a Mass vestment or for an everyday outer garment. But in the case of a cappa, or cope, this period of specialization seems to have been delayed until much later. The two hundred capp or cope, which we read in a Saint-Riquier inventory in the year 801, a number increased to 377 by the year 831, were, we believe, mere cloaks, for the most part of rude material and destined for common wear. It may be that their use in choir was believed to add to the decorum and solemnity of the Divine Office, especially in the winter season. In 831 one of the Saint-Riquier copes is specially mentioned as being of chestnut colour and embroidered with gold. This, no doubt, implies use by a dignitary, but it does not prove that it was as yet regarded as a sacred vestment. In fact, if we follow the conclusions of Mr. Edmund Bishop (Dublin Review, Jan., 1897), who was the first to sift the evidence thoroughly, it was not until the twelfth century that the cope, made of rich material, was in general use in the ceremonies of the Church, at which time it had come to be regarded as the special vestment of cantors. 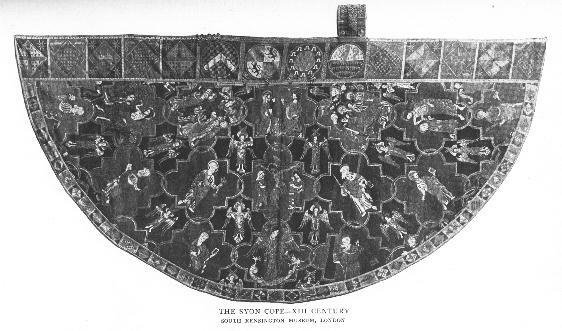 Still, an ornamental cope was even then considered a vestment that might be used by any member of the clergy from the highest to the lowest, in fact even by one who was only about to be tonsured. Amongst monks it was the practice to vest the whole community, except, of course, the celebrant and the sacred ministers, in copes at high Mass on the greatest festivals, whereas on feasts of somewhat lower grade, the community were usually vested in albs. In this movement the Netherlands, France, and Germany had taken the lead, as we learn from extant inventories. For example, already in 870, in the Abbey of Saint Trond we find "thirty-three precious copes of silk" as against only twelve chasubles, and it was clearly the Cluny practice in the latter part of the tenth century to vest all the monks in copes during high Mass on the great feasts, though in England the regulations of St. Dunstan and St. Æthelwold show no signs of any such observance. The custom spread to the secular canons of such cathedrals as Rouen, and cantors nearly everywhere used copes of silk as their own peculiar adornment in the exercise of their functions. Meanwhile the old cappa nigra, or cappa choralis, a choir cope of black stuff, open or partly open in front, and commonly provided with a hood, still continued in use. It was worn at Divine Office by the clergy of cathedral and collegiate churches and also by many religious, as, for example, it is retained by the Dominicans during the winter months down to the present day. (See CLERICAL COSTUME.) No doubt the "copes" of the friars, to which we find so many references in the Wycliffite literature and in the writings of Chaucer and Langland, designate their open mantles, which were, we may say, part of their full dress, though not always black in colour. On the other hand we may note that the cappa clausa, or close cope, was simply a cope or cape sewn up in front for common outdoor use. "The wearing of this", says Mr. Bishop, (loc. cit., p. 24), "instead of the 'cappa scissa', the same cope not sewn up, is again and again enjoined on the clergy by synods and statutes during the late Middle Ages." The cappa magna, now worn according to Roman usage by cardinals, bishops, and certain specially privileged prelates on occasions of ceremony, is not strictly a liturgical vestment, but is only a glorified cappa choralis, or choir cope. Its colour for cardinals is ordinarily red, and for bishops violet. It is ample in volume and provided with a long train and a disproportionately large hood, the lining of which last, ermine in winter and silk in summer, is made to show like a tippet across the breast. Further we must note the papal mantum, which differs little from an ordinary cope except that it is red in colour and somewhat longer. In the eleventh and twelfth centuries the immantatio, or bestowal of the mantum on the newly elected pope, was regarded as specially symbolical of investiture with papal authority. "Investio te de-papatu romano ut pr sis urbi et orbi" were the words used in conferring it (I invest thee with the Roman papacy, that thou rule over the city and the world). Under all these different forms the cope has not substantially changed its character or shape. It was a vestment for processions, and one worn by all ranks of the clergy when assisting at a function, but never employed by the priest and his sacred ministers in offering the Holy Sacrifice. At the present day it is still, as the "Cæremoniale" directs, worn by cantors on certain festal occasions in the solemn Office; but it is also the vestment assigned to the celebrant, whether priest or bishop, in almost all functions in which the chasuble is not used, for example in processions, in the greater blessings and consecrations, at solemn Vespers and Lauds, in giving Benediction of the Blessed Sacrament, at the absolutions and burial of the dead, at the Asperges before Mass, etc. At a pontifical high Mass it is worn by the assistant priest who especially attends upon the bishop. As regards colour the cope follows that of the day, and it may be made of any rich or becoming material. Owing to its ample dimensions and unvarying shape, ancient copes are preserved to us in proportionately greater numbers than other vestments and provide the finest specimens of medieval embroidery we possess. Among these the Syon Cope in the South Kensington Museum, London, and the Ascoli Cope are remarkable as representing the highest excellence of that specially English thirteenth-century embroidery known as the opus anglicanum. We are also indebted to the use of copes for some magnificent specimens of the jeweller's craft. The brooch or clasp, meant to fasten the cope in front, and variously called morse, pectoral, bottone, etc., was an object often in the highest degree precious and costly. The work which was the foundation of all the fortunes of Benvenuto Cellini was the magnificent morse which he made for Pope Clement VII. Some admirable examples of these clasps still survive. Besides the minor articles which are devoted to this subject in the ecclesiastical encyclopedias and works on archeology, we may note the exhaustive work of BRAUN, Die liturgische Gewandung (Frieburg, 1907), 306-358, also the very thorough discussion of EDMUND BISHOP in Dublin Review (Jan., 1897), 17-38; and THALHOFER, Lilurgik, I, 887. For some magnificent illustrations of copes, see especially DE FARCY, La Broderie, (Angers, 1890), and also ROHAULT DE FLEURY, La Messe (Paris, 1889), 1889), VIII, 1-17. MLA citation. Thurston, Herbert. "Cope." The Catholic Encyclopedia. Vol. 4. New York: Robert Appleton Company, 1908. <http://www.newadvent.org/cathen/04351a.htm>. Transcription. This article was transcribed for New Advent by Wm Stuart French, Jr. Dedicated to Rev. Kenneth Geyer, O.S.B.